This article will help you understand options and language for ordering table top glass or more correctly, tabletop glass. People also use the terms glass tops or glass table covers. All this information applies to other uses of glass tops such as desks and bureaus. It also provides the same principles if you are looking for glass shelves. Some tabletop glass add style and beauty to your decor while offering valuable protection to the table itself. Other tabletop glass is actually the top of the table. This is especially true for outside tables. We will look at and discuss various options. 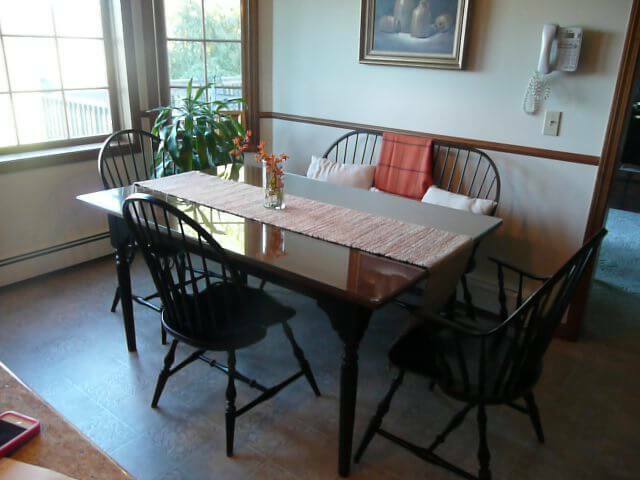 Examples of solid top tables include most dining room and kitchen tables. Coffee tables, desks, and bureaus generally are solid tops. This is very simple as they have a solid sheet of material, usually wood, underneath the glass which helps support the glass. The glass can be thinner as it is not structurally supporting the whole weight of the load. An open top table does not have solid support underneath it – the glass is supported by slats, tracking, or shelf-type supports. This is a crucial difference when purchasing tabletop glass. This glass must do a big share of the heavy lifting. Most open top tables require tempered glass to provide the structural strength to support the weight loads that may be placed on the them. There are two reasons to discuss thickness. The first one, which we have touched upon, is the weight that it can hold. That is a simple mathematical formula. The second is how it looks. That is always a trickier question and perhaps a matter of opinion. Highly regarded designers tend to feel that thicker glass is richer and better. Are they right? I will leave it up to you to decide. The most common thicknesses are ¼”, ⅜”, and ½”. Annealed glass is something everyone knows but has never heard of. It is basic everyday glass and you may think of it as standard glass. Tempered glass is toughened glass and is a safety glass. It is much stronger, has more thermal tolerance, and scratches less readily. I would not put a 350-degree roasting pan on it, but it is more forgiving. Check out more details on the differences. Many customers are puzzled by this question. Clear glass is indeed mostly clear, but it has a minor green tint when looking at it head on. "Low iron” glass is ultra-clear. This difference is quite significant. Learn more, including differences between clear glass and tinted, or pattern glass. There are different types of corners that you can get with tabletop glass. Blunt, dime, nickel, quarter, and radius corners are all options. To be blunt, you should not nickel and dime the importance of corners, so click here to learn more once you finish groaning over that pun. A seamed edge is basically just a safety edge where the burrs are removed. 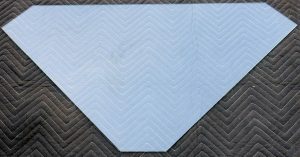 Technically, a seamed edge can have some chipping and still be considered “sellable” quality. Acrylic glass, sometimes known as the brand Plexiglas® and Polycarbonate, sometimes known as the brand as Lexan®, are sometimes considered as a replacement for tempered glass, especially in exterior applications. Tables, bureaus, desks, and cabinets come in many shapes. Squares, rectangles, and circles are easily defined. Ovals are a little different as there are different types. Most ovals we run into are elliptical or what we call race track. I did some research and found a very handy guide for picking the oval you have. Keep in mind this was allegedly made for school children. You will be tested! So what to do if your table does not fit a specific shape? At that point a simple template can be used for the shape. A simple trace of the edge with a pencil and some cardboard can be enough for us to manufacture the perfect tabletop glass for you. I didn’t realize that there were big differences between clear glass and low iron glass. I think it’s important to know what types of glass is out there so you can choose the most appealing and effective option for your table. Plus, it’s just nice to have a glass table top since they are so easy to clean and manage.